The Supreme Court has said there was “total confusion” in the country due to various personal laws governing religious practices and asked the Modi government to clarify if it was willing to implement the Uniform Civil Code. It is to be noted that BJP had promised the code in its election manifesto ahead of the 2014 general elections. “There is total confusion. We should work on the Uniform Civil Code. What happened to it? If you (government) want to do it then you should do it. Why don't you frame and implement it,” a bench headed by justice Vikramajit Sen asked the counsel representing the central government. The bench posed the query while hearing a PIL challenging the legal provision that forces Christian couples to wait for at least two years for divorce whereas other religions like the Hindu Marriage Act and the Parsi Marriage and the Special Marriage Act, and Divorce Act prescribed only one year for it. The term civil code is used to cover the entire body of laws governing rights relating to property and otherwise in personal matters like marriage, divorce, maintenance, adoption and inheritance. As things stand, there are different laws governing these aspects for different communities in India. Thus, the laws governing inheritance or divorce among Hindus would be different from those pertaining to Muslims or Christians and so on. The demand for a uniform civil code essentially means unifying all these "personal laws" to have one set of secular laws dealing with these aspects that will apply to all citizens of India irrespective of the community they belong to. During an earlier hearing in the same case, the court had said though India is a secular country today, it was not sure how long it will stay that way. The court also stressed that religious decrees cannot override the written code of law. “India till now is a secular country… we don’t know for how long it will remain a secular country. We have to stamp out religion from civil laws. It is very necessary. There are already too many problems,” the court had said. 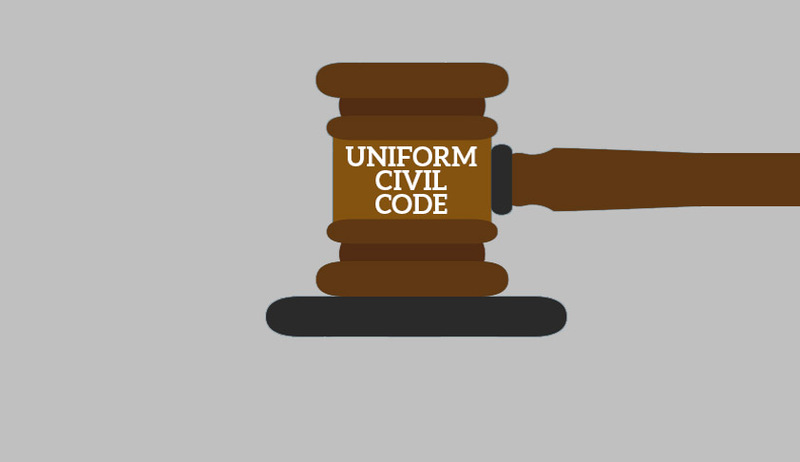 It is to be noted that soon after coming to power in May 2014, the NDA government had on July 14made it clear that the option of implementing a Uniform Civil Code is open. The then Law Minister Ravi Shankar Prasad said there is a need for wide consultations with stakeholders on the issue of a common law irrespective of religion. The debate was reignited when BJP MP Yogi Adityanath asked the government in the Lok Sabha about the implementation of a Uniform Civil Code across the country. In his written reply, Prasad indicated the government was willing to bring in a uniform code in line with a constitutional provision, but only after consultations. "Provisions of Uniform Civil Code are there in Article 44 of the Constitution. Wide consultation with stake holders would be required for further steps in this regard," Prasad told Parliament. His response indicated that the government is ready for a debate on the controversial subject. The stand of the previous government has thus been completely turned around. The Congress-led United Progressive Alliance had maintained in Parliament that its government would not touch the subject. In Maharshi Avadesh v. Union of India , Supreme Court had specifically declined to issue a writ directing the respondents to consider the question of enacting a Common Civil Code for all citizens of India holding that the issue raised being a matter of policy, it was for the Legislature to take effective steps as the Court cannot legislate. Explaining the Sarala Mudgal Judgment Supreme Court in Lily Thomas Vs. Union of India, it is held that “any direction for the enforcement of Art. 44 of the Constitution could not have been issued by only one of the Judges in Sarla Mudgal’s case. In fact, Sarla Mudgal’s case was considered by this Court in Ahmedabad Women Action Group v. Union of India and it was held that the question regarding the desirability of enacting a Uniform Civil Code did not directly arise in Sarla Mudgal’s case ”. But in John Vallamattom Vs. Union of India Chief Justice Khare held that “I would like to state that Article 44 provides that the State shall endeavour to secure for the citizens a uniform civil code throughout the territory of India. The aforesaid provision is based on the premise that there is no necessary connection between religious and personal law in a civilized society. Article 25 of the Constitution confers freedom of conscience and free profession, practice and propagation of religion. The aforesaid two provisions viz. Articles 25 and 44 show that the former guarantees religious freedom whereas the latter divests religion from social relations and personal law. It is no matter of doubt that marriage, succession and the like matters of a secular character cannot be brought within the guarantee enshrined under Articles 25 and 26 of the Constitution. Any legislation which brings succession and the like matters of secular character within the ambit of Articles 25 and 26 is a suspect legislation. Although it is doubtful whether the American doctrine of suspect legislation is followed in this country. In Smt. Sarla Mudgal, President, Kalyani and others v. Union of India and others, it was held that marriage, succession and like matters of secular character cannot be brought within the guarantee enshrined under Articles 25 and 26 of the Constitution. It is a matter of regret that Article 44 of the Constitution has not been given effect to. Parliament is still to step in for framing a common civil code in the country. A common civil code will help the cause of national integration by removing the contradictions based on ideologies.